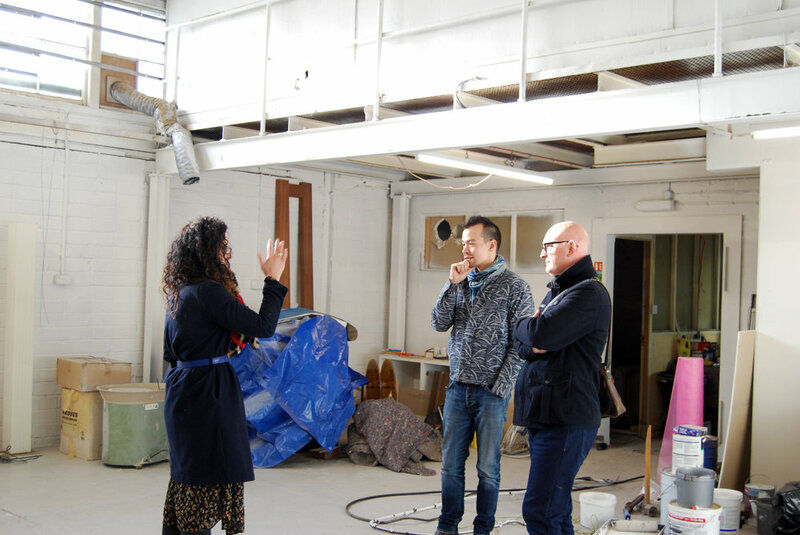 Directors Louise and Dave (and extended Clay Shed family member Barry) in the main tenant’s space chatting about clay (most probably). Our intention is to transform the main room into our resident's’ studio with purpose built spaces for up to 8 makers. Our classroom will be a flexible space, suitable for hosting a range of different workshops and classes. We will transform the old lacquer room into a fully functional kitchen and we have already installed a toilet in the former cupboard next door. Our technical room comes off the classroom space. Here we will provide our residents and students with an area for glazing, plaster and our 4 kilns. The mezzanine floor upstairs has a further space for 2 residents and this is where you will find Clay Shed management. As you can see, we still have a long way to go before we can open our doors to potters and the public. However, we have achieved a lot already in a very short period of time. We’ll add to our progress as we get there….